Aggravated Spiral Recovery - It May Not Be What You Think! 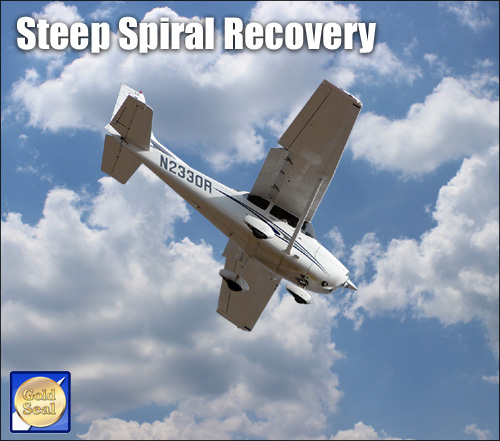 While accidental entries into steep spirals are unlikely for proficient pilots in VFR conditions, it is a common problem with potentially deadly results when a non-IFR rated pilot stumbles into hard IMC. And when that unfortunate pilot responds instinctively, the problem only gets worse. Shaped like a tornado, it is characterized by increasing roll and downward pitch along with a quickly growing airspeed. Unchecked, loss of control and structural failure in flight are likely. With good outside visual references, it is generally difficult to accidentally enter a steep spiral. 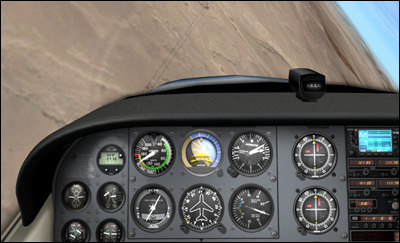 In IMC, however, entry can occur slowly and undetected if you aren't "on the gauges." Once the uncommanded spiral has developed, it matters little if you have a view of the earth. At this point, even in clear VMC, the view can be disorienting and frightening. Imagine the sight picture as your airplane rolls through 70 degrees of bank and the pitch attitude seems nearly straight down. Now, add an airspeed racing toward the red line to this image and you begin to understand the full dynamic of this problem. In straight-and-level flight, the lift vector points straight up, fully opposing the gravity vector. The spiral starts as a gentle, unnoticed bank. As the lift vector is redirected into the horizontal, the vertical component of lift is decreased. Since the gravity vector is unchanged, it wins the tug of war and the banking airplane enters a shallow descent. Uncorrected by the pilot, the roll and downward pitch continue to increase, slowly at first. But as the bank goes through 45°, the roll and pitch changes begin to increase dramatically. Faster and faster, steeper and steeper. It's only now that the pilot realizes the true severity of the situation. Something needs to be done RIGHT NOW! First action: cut the power. 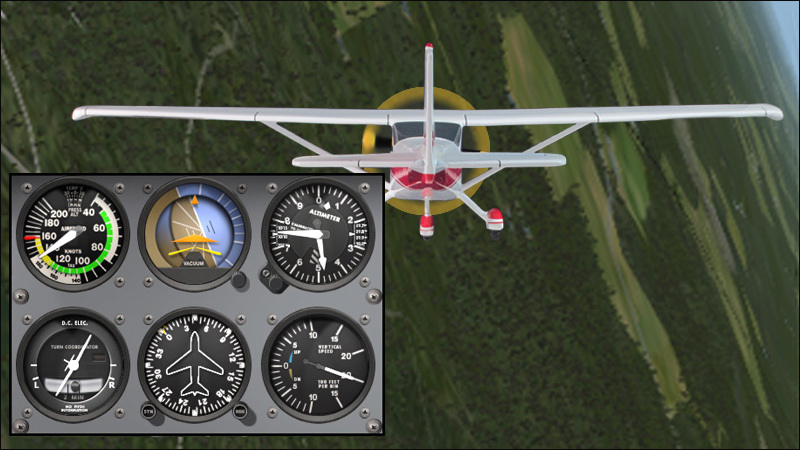 The nose is low and airspeed is increasing so quickly pull the throttle to idle. What comes next is the true deciding factor. With the nose alarmingly below the horizon, instinct tells the pilot to pull back on the yoke or stick. Early on, before the bank passes through 45° (approximately), this may work just fine. But with excessive bank angles, yanking back on the yoke compounds the problem. At roughly 55° of bank, pulling the nose up produces an arcing motion relative to the horizon. This is due to the fact that the roll is continuing during the pull. Rather than pulling back up into level flight, the pilot actually pulls the airplane into a tighter, higher-G, descending flight path. The excessive G-forces required in the pull raise the airplane's stall speed. When the critical angle of attack is exceeded, the airplane enters an accelerated stall while pointed nearly straight at the ground with the airspeed needle sweeping past the red line . . . assuming that the aircraft has not already broken up. Look at the numbers: At 75° of bank, 4G of pull is required to offset the gravity vector. At 90°, an infinite amount of force won't do it. At exaggerated bank angles, your airplane can't handle the load, and even if it could, you would transition into an accelerated stall. 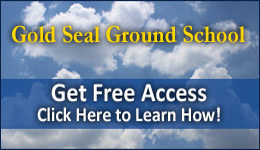 Beyond 60° of bank, most pilots will be physically incapable of pulling the airplane back into level flight. The outcome is quite simple. If you succumb to your instincts in a situation like this you will become another statistic in the Nall Report. The solution is to change your instinctive response. (1) If you've unconsciously pulled back on the controls, release all back pressure. Rather than fighting the spiral, you simply redirect the lift vector toward the sky and let the airplane fly itself out. 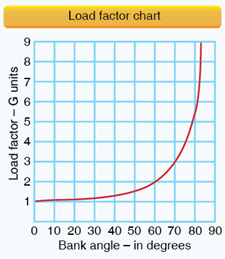 When the wings roll level, the vertical component of lift increases. This produces an immediate increase in pitch. By gently assisting the pitch up to level, the lift vector once again fully opposes the gravity vector. And you are in happy level flight. 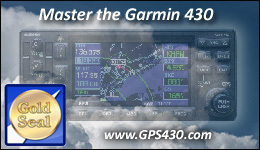 VFR flight into IMC by non-instrument rated pilots is highly dangerous. If you find yourself in this situation, focus first and foremost on your attitude indicator. You only need to line up two things: the sky pointer and the horizon line (as shown in Step 2 and 3 above). 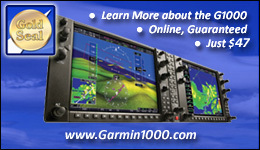 With properly functioning instruments and systems this guarantees that you are in straight-and-level flight. One-G up versus one-G down. Did you find this useful? Please share it with your friends on Facebook!